The mission of the Alpha Xi Delta Foundation is to support Fraternity educational and leadership development programming; to provide and continue to expand scholarships, grants and member support funds; and to encourage philanthropy. Make your gift now to Cora's Challenge to help to fund The Founders' Academy to build our future leaders. 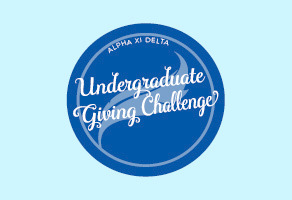 Take the Undergraduate Giving Challenge NOW. Gifts will be matched dollar for dollar to help keep TFA registration cost down.